Generally my broadband connection behaves pretty well. Indeed I threw up a speed test on Friday night to Flickr showing how close to 20Meg I was getting. Quite impressive especially as it was peak time. I also had a voice in my head saying that posting the speed test will no doubt lead to trouble. Little did I know it would be so soon. For the first time today I saw adverts on BBC News. As it happened first thing I thought maybe the BBC had decided to cash in it’s sites. I know the rest of the world get adverts so why not UK? But during the day the adverts would sometimes appear, then disappear. Hey ho. 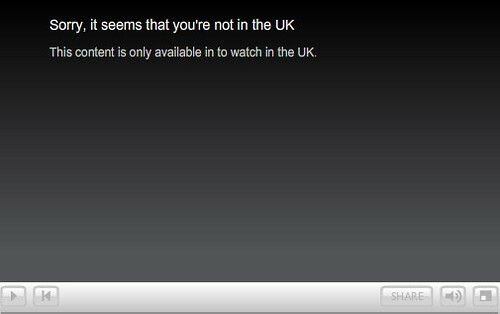 Then I tried to access some iPlayer content. Yes. Ireland. Clicking on Google took me to what it thought was my home country page. Mmm. What was wrong – Virgin Media or OpenDNS? Disabling OpenDNS showed it was Virgin at fault. A reboot of the modem made no difference. A bit of digging about showed that I wasn’t alone with this issue and that using Virgin’s webcache proxy would solve the problem. So using a proxy of webcache.virginmedia.com and port 8080 I was back in the UK with iPlayer available again. The only snag is the drop in speed. Compare the two speed tests below, the first one with the proxy enabled – quite a difference. Now I’m not convinced that the webcache speedtest is not reporting right as generally the browsing speeds all felt fine, except they should do, they are cached by Virgin. But site’s that aren’t cached all felt fine too. Weird. I’ll get onto Virgin after the weekend if this doesn’t resolve itself. Sigh. Should have never have done that initial speed test. Jinxed. Web based speedtests are inaccurate. Have you tried running a proper speedtest? As for DNS, it sounds like that’s a common problem at the BBC’s end. Yes, proper speedtest as you put it shows a decrease through the webcache. The speeds via the webcache are a round a 1/4 of what they are compared to no webcache. So the web based tests are innacurate but not by much – at least they give a quick indication of any issues. As for DNS, it’s a Virgin problem and not a BBC problem (and hence why Google also see me as being in Ireland!). If any other Virgin owners are getting this they should contact Virgin helpdesk to get it resolved. They admitted the problem…but have yet to resolve it for me.